This entry was posted in Faith & the Church, Lutheran, Society and tagged 8th commandment, bullying, Christianity, ELCA, Latter Day Saints, LDS, lutheran, Mormon, persecution. Bookmark the permalink. It sounds like you are in the process of being converted to Mormonism. Beware, they are a cult and will deceive you in any way they can. You will never be a god. The two previous people that commented sound like clones of each other. I’m guessing they are not ELCA but Mormons. Jack, nothing could be further from the truth. I am not in the process of conversion. I am simply saying that no group of fellow citizens and children of God deserve to have a 12-page screed ripping their religion delivered to their doorstep by a “newspaper” that purports to serve the community and be a community asset. God may see them as his children — but they have forsaken him in favor a false god. They in turn think they will be come god of their own planet as reward for doing the correct Mormon deeds. I’ve seen Mormons charging money for grandparents to see their grandchildren, I’ve seen Mormon women chide other women for wearing a cross, I’ve seen the children of Mormon confused by the faith to the point of disappearing from their parents and others having illegitimate children to punish the parents. I see nothing wrong with pointing out the fallacies of the Mormon cult. If you live around or work with Mormons people know what I’m talking about. LDS is the major landowner in the county where I live, so I know what I’m talking about. Beware of how they present themselves — you can be easily taken in. Thank you for defending my faith. Please explain what you mean by ‘faith-filled Mormon’ friends. Well said. And thanks. Jack you are the bully he talks about. Just stop being so mean spirited and live your life as you please. Believe what you want. Please give me the same right without demeaning me as a member of a cult. Sorry Susanne but you’d never be a god. Your Mormon faith has so many holes — please step back and look at all the fallacies. I’ve worked with Mormons. Some are nice at the outset until their true colors show. Oh, please! You’ve worked with Mormons? That’s what makes you so knowledgeable? “Im not a doctor but I play one on TV.” Their “true colors” probably show after having to deal with the likes of you for awhile. We’ll see whether they’ll ever be gods or not, but in the meantime, they’re human. Isnt this just what our country has been having shoved down our throats the last 30 years? Respect our differences. Discrimination is discrimination. Insert the word “black” in place of “Mormon”. Would that be acceptable? What they believe has no effect on your life whatsoever. God loves us all. Give it up. I was raised with a Mormon for a best friend and her family was and still is one of the nicest, most caring, most wholesome families I’ve ever seen. I’m not Mormon, but I rarely see purported Christians like yourself acting as charitable, loving, and faith-filled as Mormons. I will always defend LDS because my experience has been that they are wonderful people, AND they have the right to believe what they want because it’s not hurting you. Jack would demean you off here allowed you to remain deceived. Please study the Bible, and find out who Jesus really is. Suzanne–if you don’t like slavery then don’t own a slave! Does the same argument you used stand? “Let slave owners do as they please!” No, we should argue against all that is bad! The author is mistaken on several counts. I was raised LDS and they are not “fellow children of God.” At least not if they believe Mormon teaching. Thank you for lifting all up! I’m reading this in France where the faith community of our Jewish brothers and sisters is coming under attack. Many are fleeing France, let us always remember to lift each other up! Very well written. I agree that we should look for the good in each other. “By their fruits ye shall know them.” Thank you for working to spread peace, good will, and understanding! Jack, here’s something for you to read to soothe your soul. Chris, thanks for bringing to our attention the local rag’s hypocrisy. Chris, as a Mormon and fellow Christian, thank you for your example of Christ-like love. In this world of hostility and incessant anger, it’s good to know that there are still those who can love others and be respectful even when there is disagreement. And by the way we agree on a lot more than we disagree about, primarily our love of the Lord, Jesus Christ. As a Christian and follower of Christ my Savior and believer in the Triune God which ALL Christians believe I cannot stand by and see your cult treated as a Christian denominations when you are not. I can’t think of any doctrinal items where Lutheran Christian agree with Mormons — there are none. You don’t believe that Christ died for your sins, you don’t believe in the Triune God, you don’t believe in Baptism (as practiced by Christians) or the Lord’s Supper. Your organization is very secretive — can you name any other religion where there are secret rituals? You believe that you gain eternal life by doing good works, Christians do not. Maybe fellowship with the Mormons is something that is practiced in the ELCA — it’s not by my Christian Church. I do not claim to share any formal fellowship with Mormons, except for the fellowship of walking this earth together and looking to God to guide our lives. We certain have different types of faiths and beliefs and practices. That’s fine with me. I make no claim about any commonality between Lutherans and Mormons, though I know there are some. All that I claim is that no group deserves to have a 12-page attack on their religion thrown on their lawn – and on the lawns of thousands of their neighbors. That is patently unfair and unChristian. It is a use of power – money, and access to the press – to disparage the faith of a minority religious group. That’s called bullying, and my faith calls me to cry out against such actions. Jack would demean you if he allowed you to remain deceived. Please study the Bible, and find out who Jesus really is. Thank you Pastor Duckworth! “By their fruits ye shall know them” and by your fruits I can see that you are a real Christian. Mormons are NOT Christians in the definition that Christians use. Please do not fall into their trap. They DO NOT believe in the Trinity, they DO NOT believe that Christ died and rose again for our sins. Pointing this truth out and other truths about Mormons is very important.There is no reason to be hateful — but the truth needs to be exposed. I dont know where you get your information, but the LDS people DO believe in God the Father, His Son Jesus Christ & The Holy Ghost. We also believe that Christ died for our sins and rose again on the 3rd day. Your ‘truth’ has some holes in it. – Is it your position that Mormon teaching is not deceptive? Are you familiar with the basic reasons why Christian critics of Mormonism categorize it as such? – Do you believe that religious criticism is inherently unethical? – Do you think that minority religions should be exempted from public, widely disseminated scrutiny? – You quote Paul from 1 Corinthians 10 comes from the context (similar to Romans 14) of accommodating the conscience of others who avoid eating meat sacrificed to idols. Do you think that quote is in conflict with the way Paul critiqued the Judaizers in the Letter to the Galatians? – You essentially accuse those who published this advertisement as slandering Mormons. What in the advertisement is slanderous? This is quite an accusation of yours. Doesn’t it warrant more specifics as to what was slanderous? If ultimately unsubstantiated, then doesn’t that make your accusation of slander… slanderous? – Given that those Christians who published the advertisement live and work among the Mormon people in Utah, don’t you think they have done their homework to avoid making false accusations? Have you given them a gracious, charitable benefit of doubt as to their motives and due diligence? – As a Lutheran, would you issue similar condemnation against someone if they published a 12-page advertisement aimed at Catholicism, even if they only used moderately critical quotes that Martin Luther made against doctrines of the Catholic church? Do you believe that Martin Luther shared your distaste for religious criticism? I have little interest either in defending or in disparaging the faith of my friends and neighbors. I simply believe they – or anyone – do not deserve to have a 12-page attack on their faith delivered to their doorstep by a newspaper purporting to serve our community. What I find deceptive is an attempt to teach, as authoritative, a perspective on another religion without actually hearing from adherents of that religion (cherry-picked quotes are not enough). If one wants to learn about another religion, we should hear from believers of that religion. Just as I don’t want to learn about Islam by talking with an Athiest, or about Judaism by talking with a Buddhist, or Pentacostalism by speaking with a Lutheran, I don’t want to learn about Mormonism by talking with Christians who believe their faith is deceptive. And yes, I support freedom of speech and religious criticism. Such is lawful, and even beneficial in certain ways. What I do not find beneficial is throwing that stuff – unsolicited – on every lawn in the ZIP Code. What I do not find beneficial is one-sided debate that doesn’t give the believers a chance to share their faith and experience. We wouldn’t stand for such a screed ripping apart the faith of Catholics or of Evangelical Christians. Why do we stand for such treatment of those of another faith? I would think that you, as a Lutheran, would recognize this as a warning against heretical doctrines, as Martin Luther himself published. And with no small tumult! His publications calling out a particular church earned him ire and caused trouble in his time, as well. It was right for him to write and distribute his 95 Theses, though, because they were a warning against false teachings being spread by a church which was not founded on the word of God. People were deceived and taken captive by the teachings of that church, just as many good-hearted and wonderful people have been misled by the LDS church. I encourage you to study the teachings of the LDS church, and you will find that they will not lead you to the Jesus of the bible, nor to grace and redemption. I love Mormons, and the people that wrote this supplement do as well. It is a heart of compassion that drives them (and me) to seek to wisely divide truth from error, and give warning to brothers and sisters who may be taken captive by false teachings. I entreat you to see this as a treatise against the teachings of the LDS church, and not against LDS people. The teachings of the LDS church are anti-biblical, and need to be addressed. The people who have been deceived are valuable and precious human beings who need to hear the truth, as do all. But having Mormon missionaries show up on your porch peddling their beliefs (and withholding the facts they don’t want you to know) is perfectly fine? Ha! Most Mormon missionaries are clueless about the history of their own faith. Most Mormons don’t even know that their own leaders recently acknowledged that Joseph Smith married little girls (14 year olds) AND other men’s wives. LDS, Inc. just posted an “essay” on Joseph Smith’s polygamy on their website with very little fanfare. With all due respect, Pastor Chris. I am a Christian, a former Mormon and a daughter of the Utah pioneers. My great-grandparents converted in Denmark and pushed hand carts to Salt Lake City. Perhaps you should research Mormonism before you jump to any conclusions about the LDS church or Christian ministries who help people out of counterfeit Christian cults like the LDS church. I am in ministry to Mormons in Utah. I have known the founders of Tri Grace ministries both personally and professionally for 15 years. I can vouch to their integrity as ministers of The Gospel of Jesus Christ and their impeccable knowledge and research of Mormonism. I would challenge you to check their claims, as made in the visitors guide they provided to the public, and if you find any fault in that, please bring it to their attention and mine. I jump to no conclusions about Mormonism. This “advertising supplement” could have been about Islam or Zoroastrianism or Buddhism or Pentecostalism for all I care. I simply don’t believe that they – or any group of our neighbors, friends, fellow citizens – deserve to have a 12-page screed criticizing their faith thrown on their lawn wrapped in a garment that purports to be “news” and a publication serving the community. But I will stand behind my claim that the advertisement is deceptive, for to truly learn about another’s beliefs we need to be in dialogue with an adherent and practitioner of that religion. Just as I wouldn’t want to learn about Roman Catholicism from a Baptist, or about Islam from a Jew, or about Buddhism from a Swedenborgan, I don’t want to learn about Mormonism from people who find their religion “deceptive.” Such teaching is itself deceptive. There is room – a time and a place, as Ecclesiastes says – for voices from outside the religion, but such teaching should be accompanied by teaching from people within the religion. This publication failed to do that. Chris. Perhaps you should learn about Mormonism from Mormons. Invite the missionaries to teach you their lessons. Ask the to define words like “gospel” and “salvation” asks them who Jesus is and who we are in relationship to him. I think approaching this with an open mind will benefit you more than my personal testimony or the combined research of all former LDS believers in Christ. When the Roman Catholic church of the 1500s was teaching false doctrine, did Luther organize a round-table meeting for the truth of scripture to be presented 50/50 with the heresy of that church at that time? No, he taught the gospel boldly, in written and distributed form, and countered lies with the truth. Learning about Mormonism is a wonderful thing, and learning about it from Mormons can be good when one has a foundational understanding of the LDS church’s wayward teachings beforehand- but the teachings of the LDS church are dangerous to the soul, because they lead away from the Lord. Would you like your children to learn math from another student who was confused on the subject, or from an instructor who knew the material and its common misunderstandings? Chris, your argument is centered on what Mormons “deserve” (or don’t deserve). Christians have some experience with the concept of getting what we deserve. From God’s perspective we are all sinners and deserve eternal punishment and separation from God. But God, in His mercy, has confronted our sin and offered us the gift of reconciliation and eternal life in Him. This we do not deserve; this is God’s grace. Mormons (like all of us) need God’s grace. They need to have their sin (including the idolatry of Mormonism) confronted. You say they do not deserve to have this confrontation delivered to their doorstep. On the contrary, Tri-Grace Ministries is a vehicle of God’s grace for the Mormon people, as well as for people who are unaware of the doctrines of Mormonism who are at risk of being deceived by the public relations presentation they will hear at the temple open house. Don’t these people “deserve” God’s grace? Well, actually, no, they don’t. But our great God is merciful, and He calls His people to speak the truth in love. None of us deserve God’s grace, but neither do Mormons “deserve” to have God’s gracious truth withheld from them in an effort to protect their feelings. May God move in a mighty way among the Mormon people of Indiana, and may He continue to use the Christians of Tri-Grace Ministries as His ambassadors of true and lasting peace. slindbloom – my argument is centered on what people – no matter their faith – deserve by their nature as people and children of God. People, especially minority groups, do not deserve to be treated to an attack piece disparaging them and their faith being distributed to thousands of their neighbors. This piece was massive both in size – a 12-page “advertising supplement” inserted in a 32-page newspaper – and in distribution. The theological claims and descriptions may be true, or may contain some accuracy. That’s not my point. My point is that I do not find it beneficial to the good of the community to divide, point fingers, and target a small group for such special treatment. Thank you for your fairness and patience. It is interesting to see the dialogue as those who profess Christian values seem to lack the will or desire to practice those same values in a public forum. Your willingness and thoughtfulness in addressing this issue is commendable. Thank you! Jeff, Christian values include pointing out non-Christian values and beliefs. Mormons are experts at twisting words to make you believe that they are Christians and believe the same as you. If you notice, none of the Mormons here said they believe in the same Triune God as Christians and only look to Christ for salvation. Ask a Mormon to say one of the Creeds with you … they won’t without changing it. Thank you for this article! I’m a Mormon and have made it a point to teach my kids to learn about and respect other religions. One of our Articles of Faith states that we allow others to worship how they choose. We ask for that same respect in return. I have no anger toward others who believe differently. I am always shocked by the anger I’ve seen by those who oppose my beliefs, and I’ve seen it many times in my life, always from those who claim to be Christian. It takes great courage to write in defense of another’s faith, especially when you know many of your own faith will criticize you and your motives for doing so. Thank you for your desire to lift and strengthen your community. I am humbled by your sincere and Christlike love for all of God’s children. Thank you for writing this. Twice now you have drawn a comparison to this publication and Luther’s 95 theses. Luther did not write out his grievances and distribute them throughout the community, nor did he stand in the town square and berate the church to which he belonged. He nailed them to the door of the chapel. If the authors of this “guide” were similar to the great Luther, they would take their grievances to church that offends them so deeply. How does insulting someone’s faith, beliefs and practices serve them? How does delivering criticism to every door seek to build, inspire or strengthen the community? If they take issue with the doctrines of the Church of Jesus Christ of Latter Day Saints, then let them have an honest discussion with members of that church, not disseminate their assumptions to the whole of society. As a former Mormon and minister to Mormons and friend of Tri Grace Ministries, I can assure you we go directly to Mormons and the LDS hierarchy with our questions and concerns. Bold enough to WARN them before they were seduced into this counterfeit Christianity. Nailing the 95 theses to the Church door was equivalent to posting on the Internet today. It was how discussions were started and people were informed at that time. One thing that the blogger has failed to do is show us what were the offensive things said in the paper that he is upset about. How about sharing? Surely you can post a partial scan. Jack – Martin Luther was a priest and a professor calling for reform within the church, which was also essentially synonymous with civil power. The 95 Theses was a call for a debate at the University, and led to a massive change in both church and society – in an era very different than ours. His struggle is not ours – not that we don’t have anything to learn from him (not at all) but our context is so different that I take with a grain of salt anyone who fancies him or herself a modern-day Luther. Later he would go on to write all kinds of wonderful things – and some not so wonderful (ie, regarding the Jews and Muslims, regarding the Anabaptists and peasants, not to mention some characterizations of the Pope that perhaps didn’t heed his own teaching to interpret everything his neighbor did in the best possible light). I hardly find Luther’s fiery tongue admirable. The “advertising supplement” is divisive, inappropriate, and offensive primarily in the way it was delivered – arriving on every single doorstep in the community – wrapped up in a newspaper that purports to be a community asset, that purports to be “news.” To this end, my gripe is much more with the local newspaper than with the out-of-town ministry that paid for this advertisement. This was no blog or website that people could choose to access, no public debate that people could choose to attend or choose to refrain from attending. This “advertisement” was thrown – littered? – onto lawns by a newspaper that has no subscriptions and no known opt-out policy. It simply delivers to every address. Period. Furthermore, it arrived in a purportedly reliable community asset (a newspaper) and presented itself as a reliable, authoritative document on Mormonism. Yet, from its first page it describes the faith and teaching of Mormonism “deceptive.” Would you want someone to explain your faith to nonbelievers using such language? Would you want such an “advertising supplement” to land on your driveway, and that of thousands of your neighbors? Of course not. I find such a “teaching” document to be unfair. Instead, a document could simply list, side by side, differences of teaching, and let the reader make their own conclusions about deception. The Lutheran publishing house has a book that lists doctrines of various faiths, and puts those doctrines alongside those of the Lutheran church. It highlights differences, but does so in a way that is respectful of our neighbors and their experience of the divine. The book is called, “Honoring our Neighbor’s Faith,” and is a good read. And preferably, if someone is learning about another’s faith, they can learn both from insiders and outsiders to that faith. My best friend is Jewish. I have Muslim friends. I have Catholic friends. I have Mormon friends. Part of what I know about their faiths I’ve learned from them, and part from a respectful study of our differences. A 12-page tearing apart of one’s faith and church is not a respectful study. The content of the “advertising supplement” may be gist for discussion or a polemic to share within a particular community of faith whose goal is to convert all people to their own world and faith perspective … but to be widely distributed and thrown every lawn of the community? I find that unhelpful and divisive. I’m away from my computer all day and won’t be able to reply to comments until probably tomorrow … though I feel as if we’re all saying the same things over and over again. Perhaps it is time to put this to rest, unless new insights or ideas are shared. Or not. That’s up to you. As I can, I’ll approve comments (all comments except for spam are approved) throughout the day from my phone. You remind me of Him! Yes, the one born in the meridian of time, in Bethlehem. Thank you for all you do to further His work! The adage that “when all is said and done…there is always more said than done”… Is true here! Again, like Him you are out “doing” while others feel they can fulfill they’re discipleship by “saying”. Here is that reference to the Jewish author on anti-semantics. There’s just NOTHING in this world as bad as Anti-Semantics is there? However, when I confesss that when it comes to Mormon spin doctoring and white washing I am INDEED Anti-Semantic, this is very true indeed! … and yet the blogger refuses to give examples of the ‘advertising supplement’ he received. Wonder why. Just for the record …. your denomination, the ELCA, regularly makes unkind remarks about other Lutheran denominations. Did you see my comment above about being gone all day and not responding until tomorrow? Also, I do not know about any record of unkind remarks my denomination makes “regularly” about other Lutherans. Individual members of my denomination? Of course. But the “denomination” in official records? Perhaps, when read from a certain point of view, but none that I can think of off the top of my head. Thank you Pastor Chris, I appreciate your fair treatment and willingness to learn from active & practicing Latter-day Saints as opposed to those to who have left the church & claim to know all about it. I’m an active Mormon, and also a web-site developer.. one of my main clients over the past few years has been the ELCA, and I’ve worked closely with the leaders of the Region 1 Synod here in Portland OR doing web development for them.. (soulcafe.org). BTW – You can also visit mormon.org or LDS.org & search for any topic you like to learn what we actually believe on subjects like salvation, Christ, or any other topic. I grant that some of these anti-mormons are motivated by genuine concern for us, but I do question their methods. I always think it’s strange when people say, “No – that’s not what you believe, let me tell you what you really believe”.. I mean – If I want to know what the Lutheran’s believe, I would just ask them. I suppose even bad press is good press as they say, and it can be helpful and interesting to hear what ex-Mormons or anti-mormons claim about us. But I would encourage people to at least allow practicing Mormons to have a chance to refute them. Most people tend to just believe the first thing they hear, and don’t do their own research. Why would the ELCA hire a Mormon ad agency to do evangelic type work for them? This sounds really weird. You’ll learn nothing by going to the LDS web site. Google Mormons and watch some of the videos of past Mormons. You’ll learn how deceptive they are and what they do believe in. No doubt there are nice Mormons but it is a cult that takes advantage of people leading them to Hell. Mormons have grown in number because they offer new followers the thought of being a god of their own planet. An offer they cannot fulfill. Well I’ve been a Mormon for 45 years, and work in the temple every week.. So I’m fairly confident that I understand what I believe, and don’t really feel a need to Google it. Thanks though. And the ELCA didn’t hire me because I’m Mormon, they hired me because I’m a web developer. I just brought it up because I though it was interesting. As someone with an advertising degree, I find it interesting that the pastor is most upset with the newspaper’s decision to print an advertsiing supplement, as if this piece were maliciously thrown into the readers’ faces. If I’m correct, the supplement is *not* a required read. However, as with all ads, the recipeint who owns a a garbage can (or a bird cage) has every right to ignore the piece and move on. Or does the pastor rag on the TV commericals (some with questionable ads), the daily advertising mailers in the mailbox, or the billboards on any drive to the store? And does he get angry when someone knocks on his door and wants to share their gospel truth (as compared to others)? If so, I would imagine there would be conitnual frustration 14 hours of the waking day for anyone with such thin skin. Just accept the idea that, for now at least, America is a country with First Amendment rights and move on. Those who wish to discuss the pros and cons of what the newspaper says can be left to their business in the Free Enterprise of ideas. With my “thin skin” I’ve allowed every single comment here, many accusing me of all kinds of failings as a Christian. In my blogpost, I acknowledged that the local newspaper and the out-of-town ministry has a right to do what they did. I just find it in poor taste, and a very poor decision for a newspaper that purports to reflect and serve our whole community. Hi Chris, as one who has been in formal and friendly interaction with LDS people for well over 25 years and extensively researched and attended their public events in over 10 countries, I’m saddened by your response that refers to the Tri-Grace insert as Mormon Bashing. The Tri-Grace staff are a gracious, caring people who have eternity in mind as they attempt to warn people away from a religion that has used deception and manipulation in its proselytizing since the beginning. Joseph Smith’s lying and deceit and the LDS Church’s attempts to sanitize their history and misrepresent their own teachings, has been amply documented by their own people. Just do a Google search on “Lying for the Lord” (the LDS term, not mine) and look at the extensive documentation and multiple examples of how this permeates LDS culture, most of it provided by former LDS religious instructors. What people may not understand is the aspect of LDS culture that believes anything deception or misrepresentation is acceptable if your motive is to protect the image of the Mormon church and its leadership. This is why Joseph Smith and other LDS leaders lied repeatedly about polygamy, Mitt Romney lied about Mormon teachings in interviews on TV, it’s why LDS leaders lied to BBC interviewers in their documentary on Mitt Romney (The Mormon Candidate), it’s why LDS leaders lied during a TV interview in El Salvador, and Helen Whitney did a segment on Mormon deception after producing her PBS special on the Mormons. I’ve had local LDS leaders in various countries lie repeatedly to me and those around me after taking a tour of a Mormon temple, denying even their own basic doctrinal teaching, and do so right up to the point where I pulled one of their own books or manuals out of my backpack. Then, what they were vehemently denying minutes before, they began affirming and defending. Why? Because they knew the teaching of Joseph Smith I was citing was decidedly not Christian and at odds with the teachings of the Bible and the traditional Christian churches of that city. I can pretty much guarantee that, unless this temple open house is somehow radically different than the dozen or so others I’ve attended, you will not learn about the core doctrines of Mormonism, you will learn nothing about the true nature or history of Joseph Smith, you will not even be told that “The primary purpose of the temple is to provide the ordinances necessary for our exaltation in the celestial kingdom” (LDS Apostle Hales in The Ensign, Oct 2009 available online at LDS.org) or that “Every boy and girl … [ellipsis in original] should know that the [temple] ordinance of sealing is an absolute, and that without it there can be no salvation in the eternal world, no eternal life” (Achieving a Celestial Marriage, p. 204). The Mormon Church has a right to their beliefs, but if they will not be honest and open with the public about these beliefs and their own history, I find this to be far more problematic and offensive than a group like Tri-Grace that provides an accurate and thoroughly documented critique that provides the public with “the rest of the story.” Joel B Groat, Dir. of Ministries, Institute for Religious Research. The blogger still hasn’t given examples of Mormon bashing. I’m waiting for examples too. You’re asking us to give people meat before milk. Just because we don’t give complete strangers every detail and possible ramification of temple doctrine – that doesn’t constitute a lie. Many doctrines – which are completely true – will sound very strange to outsiders who haven’t had time and experience to learn. I could give the same complaint against traditional Christians.. Why don’t you tell people what you believe about the millions who lived on the earth and never heard the gospel? Although they had no chance, if someone is a Buddhist or a Muslim or of any other faith, when they die they will go to hell – oh and, forever…and ever (according to you)? That’s what Christians believe (see I can do it too). You should broadcast that more.. I mean it’s true right? Or have I oversimplified? Not very nice is it? Christians don’t have secret handshakes, secret temples, secret ceremonies, secret rituals, secret beliefs. Many Christian churches are actively trying to reach unbelievers throughout the world. Christians are not offering a faith where there is a promise of becoming a god if they do enough good works. God’s grace and salvation is free. Excuse me Chris I would like to know what in the paper was not true? If everything in that paper is true how can you say they are christian? Different God, Different idea of Jesus, Different Gospel, Different heaven, there is nothing but morals that connect Mormons and Christians. Mormonism is about as far from Christianity as Buddhism is. Let the truth come out (aka this paper) and let people decide for themselves if Mormons are christian. I’m not here to argue theology, or to make any claim about the nature of Mormonism. Instead, I am suggesting that the publishing of this piece was not beneficial to our community, but instead served to divide our community and disparage our neighbors. In my walk of faith, there are other – better – ways to witness to God’s truth, live into the promises of God’s kingdom, and walk humbly with God. And a 12-page attack on my neighbor’s faith is not one of those ways. Christianity is such a small portion of the worlds population… While all 4000 Christian faiths all have doctorinal differences, we also share similarities. Atheists, Radical Islam just to name a few! Thanks for trying to bridge the gap for us. Chris, you show how far various Lutherans have become Apostate. Mormons do not believe in salvation by grace alone through faith alone in Christ alone. They add faith to works and I am well able to demonstrate this. Mormons do not believe that there is one Lord/one God in the form of three persons, Father, Son, and Holy Spirit. They believe that the Father, Son, and Holy Spirit are three different gods.I am well able to demonstrate this. They do not believe in the infallibility of scripture. They teach that God was once a man. They teach that the universe is eternal. These folks are not Christian. And the most loving thing these people can get is a dose of truth. 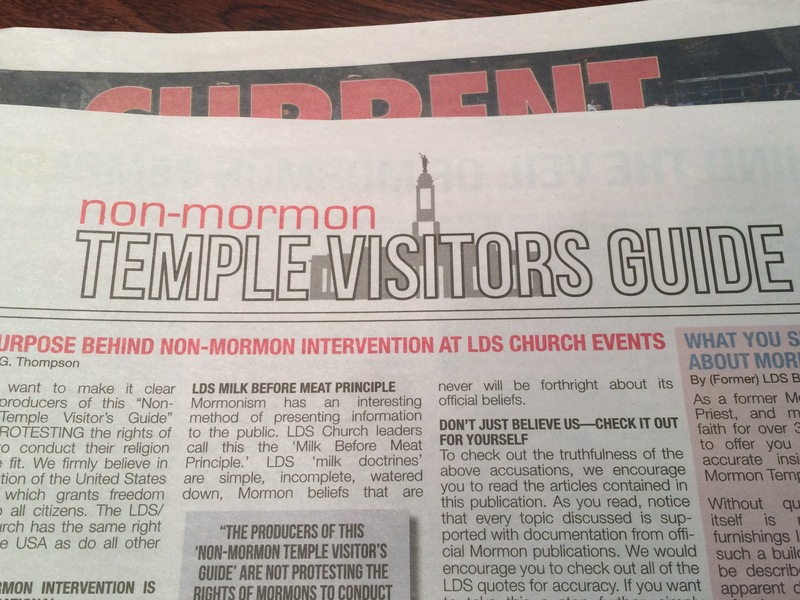 But this article in the newspaper wasn’t for the Mormons. This article was to educate the local unbelievers and uninformed Christians regarding this false religious movement… Here are some questions to ask a Mormon regarding their belief system. Please note, these are not personal attacks: 1)	How did the first man appear before there ever was a God? This question may not seem important at first. Until you realize that if man becomes a God and there had to be a first God. How did that man appear and how did he become God? The Bible teaches us that God created Adam and made him a living being. 2)	Who was the first God? If there was a Father to our Father God, that makes him our spiritual grandfather. We should know our grandfather’s name. Right? The Bible does not teach this though. We are told that the God of the Bible is the only all-powerful, all-knowing, everywhere-present God. 3)	Where did creation come from? May we call it creation? We have to come to a conclusion on these thoughts. Is the universe eternal or was it created? If it is eternal, that means that our God and all other Gods are dependent on the universe. In other words, if the universe never had existed, nether would any god. John 1:1 In the beginning was the Word, and the Word was with God, and the Word was God. 2 He was in the beginning with God. 3 All things came into being through Him, and apart from Him nothing came into being that has come into being. 4)	Where does God get his power? Where did the first God get his power? This is another one of those thought provoking questions. If God is reliant upon the universe, because it is eternal and he is not, then where does his power come from? Something caused him to gain his power. The question is more importantly asked of the first God. 5)	Have you prayed about every one of the ten’s of thousands of religions on the planet? Could you have gotten a stronger burning in your bosom by praying for one of those? 6)	Are you able to find one or, better yet, two non-LDS archeologists who are able to corroborate the Book of Mormon as historically and geographically accurate? The Bible does have a history of being accurate enough to use as a map by archeologists looking for ancient antiquities. You may go to the holy land and see for yourself what is shown in scripture. There are historical documents, physical structures, and geographical locations. You are not able to do this with the LDS scriptures. There are no historical documents, there are no physical structures, and the geographical locations are not where the LDS church teaches. 7)	Has there ever been found examples of Reformed Egyptian and has it been confirmed by a non-LDS expert? 8)	Which Indian tribes in North, Central, and South America have Hebrew DNA? If there is a tribe, how are you able to link them to the BOM? There is one tribe who possibly has ties to the Hebrew people. That is the Cherokee tribe. But even that is suspect.That possible link is connected through the Scythians who were world travelers. It is believed that these Scythians transported Hebrews to North America thousands of years ago. There is no connection at all of Hebrew DNA to the natives of South America, Central America, and most or all of North America. Researchers have found that 99.4% of the DNA tested from these Indians was from Eastern China and the remaining is from European and Africans who came to America in the 1500’s and later. 9)	Do you believe that there are false prophets? Could you describe a false prophet? Do you know of any? What are we supposed to do about our relationship with false prophets? 10)	What exactly do your works accomplish in relation to your salvation? The Bible clearly teaches that salvation is by grace alone through faith alone in Christ alone. True salvation produces good works. Good works proves a person is saved. It is not part of salvation. This is important. From the perspective of the Christian, we cannot earn our salvation. If we have to work for salvation in addition to faith, that means either Christ’s blood was not enough to pay for our sins, or we are able to dilute or frustrate Christ’s work. The Christian’s work is meant to glorify God. 11)	What makes the LDS Church different than any other of the works-righteousness religions? What makes LDS works better than others’ works? What many Saints do not know is that their works based theology is not much different than that of the Jehovah’s Witnesses, Islam, and the Roman Catholic Church. Each adds works to faith. 12)	Why should we believe that the Bible is in any way in error or unreliable (“not translated correctly”)? There are tens of thousands of manuscripts of scripture dating back to the second century. Additionally, the Church Fathers quoted scripture liberally. Between these two very large sources of scripture, the Bible is found to be very reliable. Dr. Dan Wallace from Dallas Theological Seminary is a great resource on Textual Criticism. A person may learn Koine Greek easily with the numerous seminaries and on-line classes. The thought that the Bible was translated from its native languages to Latin then English, or into other languages before English is not representative of the facts. With the amount of data out there, textual critics are able to put together within about 0.5 % the actual autographs of the New Testament. Those scriptures that are questionable are documented as so within the Bibles, such as the woman caught in adultery and a significant portion of Mark 16. There are tens of thousands of manuscripts as well as a liberal amount of quoting of scripture by the Church Fathers. Regarding the Old Testament, we have the reliability of the Jewish copyists. And fortunately, copies were kept in various places. We also have the Septuagint, which was translated a 100 or 200 years before Christ. Now that you have read this far, you may be completely offended. You may be very curious. You may be very concerned about your eternal destiny and that of friends and family. I ask that you read the Gospel of Christ which comes straight from scripture. and our eternal destiny will be spent receiving the just punishment that we deserve. Dear Lord, I am a sinner in need of a Savior. I have fallen short in every one of your commandments. I have kept none of them perfectly. I ask that you forgive me of my sins. I ask that you cleanse me of all unrighteousness. I ask that you make me the righteousness of God in Christ Jesus. I take myself off of the throne of my heart and ask that Jesus take his rightful spot. Jesus, I acknowledge that you are both Lord and Savior of my life. I deserved Hell. Thank you for saving me. Amen. This prayer does not work unless it is done with true faith. Otherwise, they are just words. If you prayed that prayer, feel free to contact us. We will gladly point you in a direction that will be beneficial to you. Please consider visiting our web site and read more about the Gospel. See the link just below. Just so it is clear, I own and have well-marked up from research the Book of Mormon (BOM), Doctrines and Covenants (D&C), and the Pearl of Great Price. I also have Joseph Smith’s “New Translation of Bible. I also own a copy of the Original BOM with its 3913 errors. As noted by others here the irony here is just stunning – and on so many different levels. Especially ironic, I think, coming from a Lutheran Minister. If this is indeed “unfair” and “false witness” then why, pray tell, are current and former members protesting the behavior and challenging Mormon leaders to change it? I would humbly suggest that perhaps the harsh assessment of Tri-Grace Ministries in this article should be reconsidered given the hard realities surrounding the state of the modern Church of Jesus Christ of Latter-day Saints. Gospel Principles is an official LDS Church manual that’s used in Sunday School, Home Teaching and other educational settings. D&C is the standard abbreviation for “Doctrine & Covenants” one of four of the Standard Works of LDS Scripture. The other three are: The Book of Mormon, The Price of Great Price, and The Bible. Gordon B. Hinckley was the 15th President of The Church of Jesus Christ of Latter-day Saints. It’s lovely that you have a pre-prepared list you can just copy & paste in here.. Must make your online efforts to “reform” the church so much easier. So, I’ve never heard of your organization.. Not exactly making many waves I guess. 66. Are you referring to BYU professors? Because the clergy is not paid. 71. Untrue. You can check the current gospel topics essays on LDS.org for the church’s scholarly look at some difficult and embarrassing moments of our history. Church leaders are not perfect, nor have we ever claimed them to be. It’s lovely that you have a pre-prepared list you can just copy & paste in here.. Must make your online efforts to “reform” the church so much easier. So, I’ve never heard of your organization.. Not exactly making many waves I guess. Well, we could care less about fame, we’re after reform. And since we’ve been doing this (as stated previously) over 4-years we have seen some positive movement in the LDS Church that are along the lines of issues that we’re addressed – so much so that some older theses in past 95 LDS Theses have had to be dropped. To clarify the ELCA is a shell of it’s former self. They are mostly a social cause organization and have given up many of the beliefs of traditional Lutheranism. Please stop using Martin Luther to promote your non-Christian religion. @Jack, I’m not sure if your comment was directed at myself, Mr. Duckworth, or someone else. However, if it was me you’re badly mistaken: I am neither ELCA or Mormon and have neither been either. Rather than being Trinitarian, modern Mormonism is Tri-Theistic (Three persons and three beings) in it’s view of God (One Being God, consisting of three persons). Jack did, in fact, speak correctly. I hope that this helps clarify. They removed the graphic penalties from the endowment ceremony in April of 1990. The silly handshakes that Joseph Smith borrowed from freemasonry are still part of the ceremony. Before 1990 the temple ceremony also featured a Protestant minister as a hirling of Satan. The Book of Mormon refers to ALL non-Mormon churches collectively as “the church of the devil” and “the great and abominable whore of the earth”. Mormon scriptures claims that ALL non-Mormon ministers as “corrupt”. If you want to see what Mormons WON’T tell you about their temples, just go to YouTube channel “NewNameNoah” and you’ll be shocked. I was born and raised a Mormon and, like most Mormons, knew almost NOTHING about the temple endowment ceremony until I was actually going through it. Educate yourself. Mormonism is a cult. I’m a practicing Mormon myself and have been treated very poorly by some other Christians in regards to my faith on the internet. I am so happy to see that not everyone who does not believe the things I do is out to destroy my faith. Also, I’m going to follow your blog. Peace be unto you. You spoke truth, and some people cannot stomach truth. They are so busy focusing on what they are against that they can no longer see what (and who) they should be for. Since you wish to build up – and not divide – I would highly encourage you to have Mormon Missionaries speak from your pulpit to your congregation. I encourage you to encourage your congregants to invite the LDS Missionaries into their homes to learn of the “basics” of Mormon doctrines. I encourage you to take a year or two hiatus from your pastoral calling and commit to being an active LDS member – going all in – submitting yourself to the Authority of the LDS Priesthood. Then, after that commitment, I would encourage you to give the Jehovah’s Witnesses a fair and open look for community building as well. After all, it only makes sense to walk a mile in their shoes… in order to bring about a fair and valid and “beneficial” discussion on “building up” our communities. Until someone in your position is willing to do that, I think you should leave the open communication to those who have first hand experience with LDS Temple open houses… and the typical consequences for curious Christ-leaning, biblically illiterate, non-Mormon visitors. All I wish to do is for people of different faiths to live peaceably and respectably side by side. This is basic human decency. I do not find this piece, and its manner of distribution, to be respectable or decent. I’m all for evangelism, too. But rather than lead with an attack, I believe the best evangelism is to speak affirmatively about your God and faith, to live a just and righteous life, and to work to build up the Kingdom of God with acts of care, sacrifice, justice, and mercy. There is a time and a place to speak directly to the differences between religions, and to make the case for one’s own faith. But I do not believe a 12-page attack ad (inserted in a 32-page newspaper delivered to every address in the community) is that time or place. Thank you for the conversation. I have approved all comments posted here so far. Some of these comments have thanked me for this post. Some have accused me of apostasy, of supporting heresy, and of not being Christian myself. Many more have devolved into debates about whether Mormons are Christians. As I have stated above in comments and in my post, my gripe about this “advertising supplement” was less with its content – though I do find it to be an unfair attack on my neighbor’s faith – than with its distribution. A 12-page attack of our neighbors’ faith was set inside a 32-page newspaper and delivered to every house in our community. I find that to be a form of intimidation and bullying. We do not need neighbors turning against neighbors. We need mutual understanding – not necessarily agreement – but understanding and respect. This piece, and its massive distribution, failed to do either. I’m turning off comments at this point, as I don’t see the conversation going anywhere constructive at this point. We’ve made our points. Accusations have been leveled. Links shared. Entire documents copied and pasted. I will keep all of this up, of course, so that others can benefit from this conversation – whether the original post or the material shared in the comments.